the newest Beagle at Last Hope…but that is always subject to change. 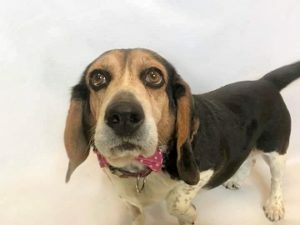 PENNY is an expressive 6 yr old Beagle who would love a Weight Watchers partner. She made the long trek to Last Hope from Hempstead Town Shelter, and would like to increase the speed with which she can walk that far. She likes other dogs, and walks nicely besides them. Lots of Beagle to Love!